Tobacco/nicotine dependence is a condition that often requires repeated treatments, but there are helpful treatments and resources for quitting. People who stop smoking greatly reduce their risk for disease and early death. Although the health benefits are greater for people who stop at earlier ages, there are benefits at any age.1,4,8,9 You are never too old to quit. Lowered risk for lung cancer and many other types of cancer. Reduced risk for heart disease, stroke, and peripheral vascular disease (narrowing of the blood vessels outside your heart). Reduced heart disease risk within 1 to 2 years of quitting. Reduced respiratory symptoms, such as coughing, wheezing, and shortness of breath. While these symptoms may not disappear, they do not continue to progress at the same rate among people who quit compared with those who continue to smoke. Reduced risk of developing some lung diseases (such as chronic obstructive pulmonary disease, also known as COPD, one of the leading causes of death in the United States). Reduced risk for infertility in women of childbearing age. Women who stop smoking during pregnancy also reduce their risk of having a low birth weight baby. Since 2002, the number of former smokers has been greater than the number of current smokers. Get free help online, too. For information on quitting, go to the Quit Smoking Resources page on CDC's Smoking & Tobacco Use Web site. 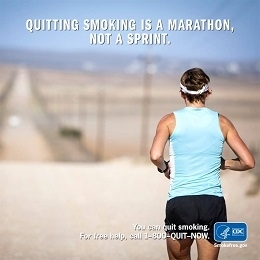 Read inspiring stories about former smokers and their reasons for quitting at CDC's Tips From Former Smokers Web site. The I'm Ready to Quit! page links to many helpful resources. Visit CDC's Online Publications Catalog to order free copies of materials about quitting as well as helpful resources about tobacco use prevention.